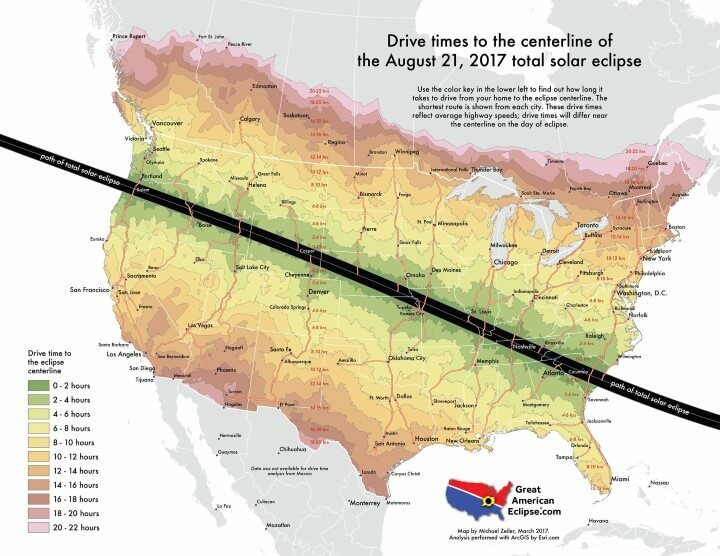 The map above shows how long it takes to drive to the centerline of the total solar eclipse that will occur on August 21, 2017. This of course assumes normal driving conditions on the day. The map itself comes from GreatAmericanEclipse.com, which you should really visit if you have any interest at all in viewing the eclipse, since it has an enormousness wealth of information on every possible aspect of the eclipse. If you are going to view the eclipse please make sure you purchase some certified Solar Eclipse Glasses, a viewer, and/or binoculars. Attempting to view the eclipse without them can result in blindness.